Geothermal heat punp. What are the savings? GHPs consume 25–50 percent less electricity compared to conventional HVAC equipment, so installing one is a great green home remodeling project. In other words, a GHP needs only one unit of electricity to move three units of heat compared to a ratio of 1:1 or 1:2 for other systems. GHPs can decrease energy consumption and the accompanying emissions by as much as 44 percent compared to air-source heat pumps and as much as 72 percent compared to standard electric heat. 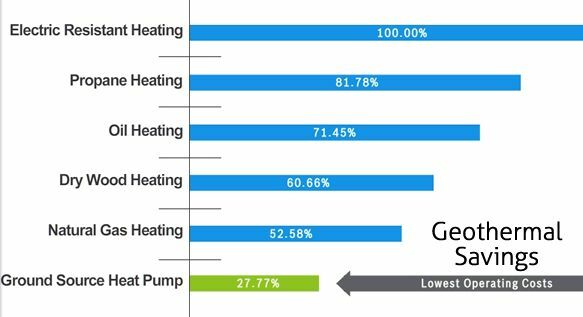 GHPs can achieve efficiencies of 300-600 percent on the coldest winter night; air source heat pumps can only reach 175-250 percent on just a cool day. GHPs also maintain an approximate 50 percent indoor humidity level, making them desirable in humid areas. The up-front cost of geothermal as a home renewable energy source is steep. However most experts agree that you can recoup this investment in 5-10 years through lower energy bills, making it even more attractive as a green home remodeling project. Federal, state, and local tax incentives and other programs can help offset the cost of the initial investment as well. With few moving parts, a GHP system is also durable and needs little maintenance. Many manufacturers warranty the pipes for 50 years and the pump itself usually lasts 20 years. According to the new market research report 'Global Geothermal Power and Heat Pump Market Outlook: (2010-2015)', published by MarketsandMarkets, the global geothermal installed capacity, including power generation and direct use, is expected to grow from 61,200 MW in 2010 to 120,300 MW in 2015 at an estimated CAGR of 14% for the same period. The main driving factors in the geothermal market are environment-friendliness and lower operating and maintenance cost when compared to conventional fuels. The favorable policy and regulation framework and recent investment activities by governments and venture capitalists are boosting the development of the geothermal energy market. However, the growth in the market is impacted by higher initial cost and limited geographical availability of resources. All these reasons make Europe and Americas leading regions in direct use and geothermal power generation respectively. The global cumulative installations of geothermal heat pumps are expected to grow from 2.94 million in 2010 to 5.66 million in 2015 at an estimated CAGR of 14% for the same period. The major countries using geothermal heat pumps are Germany, Netherlands, Norway, Sweden, and U.S. The major portion .i.e. around 67% of geothermal energy available for direct use is utilized by geothermal heat pumps for space/district heating requirements. Geothermal heat pumps rely on the natural temperature of the earth to heat up well water before it is sent to your home faucet. There are several regulations that must be followed to use one in Virginia. A geothermal heat pump is an efficient way to use well water. A geothermal heat pump pulls water from your well and heats it up while it is still in the pipes that connect the well to your house. 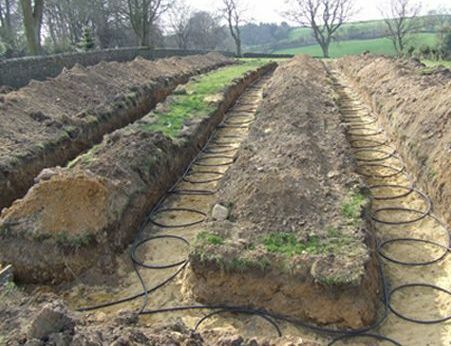 The heat pump keeps that water hot using natural ground temperatures, so it is environmentally friendly. In Virginia, wells must extend above the ground by at least 12 inches. If you have a geothermal heat pump well that is set up on a closed loop and heated by a geothermal source, you do not need to adhere to this regulation. Most wells in Virginia need to be encased in 20 feet of concrete or a similar material underground in order to protect the ground water in case of contaminants. However, closed-loop heat pump wells, which keep the water within the system, do not need to be encased. Solar energy and geothermal heating and cooling systems have advantages and disadvantages in terms of cost, installation efficiency, seasonality, local zoning requirements and restrictions. The biggest factor is going to cost compared to the usability of systems. Solar can work without electricity, but other than that they are very similar. Solar heat pumps work by pumping a coolant solar panels mounted on the roof. Coolant is heated by passing through the collector and then transfer to a heat exchanger. Refrigerant absorbs heat in the heat exchanger and passes through the compressor when the evaporator required airflow passes. The end result is the same as a normal heat pump. Can only heat pumps for heating be amended and used for air conditioning, refrigeration pumps do not have this ability. standard parts geothermal heat pump includes a compressor, heat exchangers, air trainer and eliminate condensation on air conditioning use. All these components are usually packaged in a cabinet. "The size of the system will depend on the heating and cooling your home. Geothermal heat pumps can provide a stable domestic hot water until the pump is in the air. There are two main types of lines - an open and closed. The most popular type used for decades was an open. But the closed lines and their variants is increasing in popularity. Lines are the backbone of the geothermal heat pump systems. They work by pumping water from a well, which is between 100-400 meters depth online to a cold heat exchanger, which either absorb or dissipate heat, depending on the desired function: heat or cold. After the underground heat has been used then pumped back to the individual becomes better. Closed loop is the same, but the water is constantly recycled. Distribution of heated or cooled air is the same as a conventional air conditioning and heating units are available in most modern homes. The difference comes from the possible need for a system to reinforce the traditional engine-driven heating and cooling systems. The efficiency of solar systems are totally dependent on weather and climate at the time, while geothermal energy is more reliable, year-round system, almost regardless of outside temperature. The main reason for the two systems is the initial cost for installation. Solar system will be more effective for smaller houses, while the geothermal system will be better suited for large designs, leading to unnecessarily high costs for installation of electrical circuits. Another factor for geothermal power plant land surface. Depending on the size of the line that required a wide range of fields may be needed, but a plot may be too small for the system. Save On Heating Cooling Costs Save The Environment.